We offer our members year-round social and recreational activities: skiing and snowboarding, hiking, biking, wine tasting, summer BBQs, parties, and more. 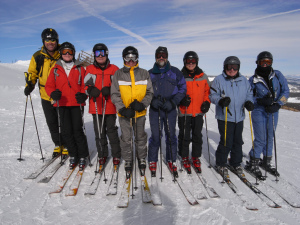 The Long Beach Ski Club continues 3-night weekend trips to Mammoth. See the WEEKEND TRIPS tab. Our skiers and boarders span the levels from beginners through intermediate to expert. While many have great memories of ski resorts around the world, some of us are just starting to make memories. At any level (including window shopper) you can join the fun! General Meetings Feb 6, Mar 6, Apr3 at Ecco's Pizza. Board Meetings Feb 13, Mar 13, Apr 10 - contact Kris, if you'd like to go. Wine tasting Feb 16, Bistro St. Germaine - rsvp with Lance. Mammoth has lots of Feb snow !!! Club Condos at Mammoth: Feb 21-24, Mar 14-17 - contact Mike today!